I have always experimented when painting. It's boring to do the same thing over and over again. So I sponge, splash, pour, use my finger tips, and even remove paint. 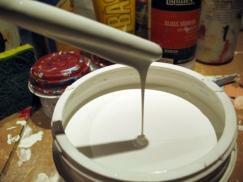 I love the actual thickness of paint, the way it pours and overlaps after each layer is dried. Brushes serve their purpose and use them even though I don't want to show brush strokes too often. But I go searching for that little bit of magic that I they just can't create, or maybe they can? More often than not, I find that I use the opposite end of the brush to get the right flow of paint onto the canvas. The angle and length of the handle helps to determine the speed and amount of paint. It takes a bit of luck, this pairing my own orchestration with that of the natural flow and effect of the paint and water I work with. What I want in the end is a painting that has texture and a unique appearance all its own, as if it grew out of the canvas.